European Roulette is the most popular and loved roulette variant for all roulette players thanks to its easy rules to play and lower house edge if to compare with American Roulette variation. 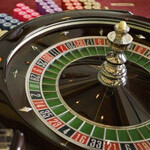 To get further information about the different kinds of roulette games it is worth reading the roulette guide. Certainly, this roulette game is played in European countries preferably but the USA casinos also provide it for their clients because the majority of gamblers want to try this roulette game, as it really has better chances of winning. European Roulette is played with the help of one-zero wheel and this fact makes it to be so attractive to players; a modern European Roulette wheel was created in Germany in 1843 (though the game itself was invented in the 17th century in France); and it consisted of 37 sectors: 1-36 colorful (black and red) ones and one green 0 sector. How to play European Roulette? Well, it is not very difficult indeed: the main thing is to know the types of roulette bets and some small secrets; but do not forget that roulette is the game of luck, so, it is not necessary to believe various betting systems as they do not work anyway. So, choose a wager to bet on, make your bet and pray. 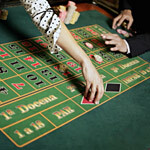 Remember, that you have no right to change your bet or add a bet after a croupier says the phrase "No more bets!" and when a special thing for marking a winning bet (a dolly) is on the roulette table layout. Do not forget to buy special roulette chips before the game because it is impossible to play roulette with the help of regular casino chips. After the game you will exchange them for regular chips and receive cash. 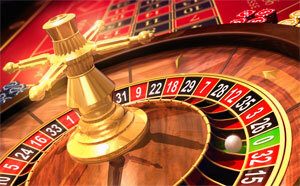 Moreover, do not forget about roulette etiquette as it is the important part of every game. There are two types of roulette bets to remember: inside and outside bets; a player has a really big number of different options to bet on, so the chances to win something at least are really big. 1. Inside bets can be placed within the numbered part of roulette table layout: these are the bets on any particular number or group of numbers. 2. Outside bets include some additional options a player can bet on which are located outside of number sectors of a roulette table: a gambler is welcome to bet on red or black number, odd or even number etc. This is the reason of European Roulette's popularity among gamblers: it is only 2,67% if to compare with American Roulette (5,26%).